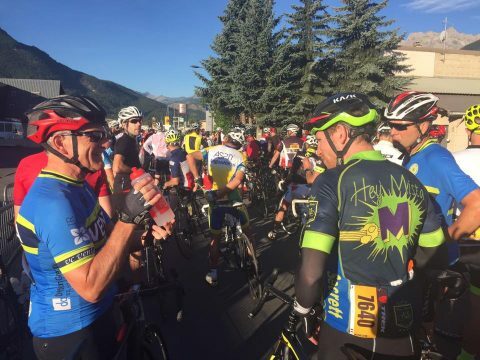 “Stop thinking about it and just sign up!” The mental act of committing to L’Etape will help you get over most of the obstacles that were worrying you in the first place. Its a big challenge but life becomes much simpler with a goal or shoreline to aim for. “It’s hands down one of the best events I have ever done!” – so what are you waiting for? When registering, put down a time that is slightly faster than you think you are capable of. That way, you will end up starting a little earlier and, who knows, it might push you to train for that quicker time! The start pens go from 7am to 9am. If you have friends you want to ride with, make sure you all put down the same expected finish time, as they can be strict with pen allocation. “Both of us had previously smashed out long 100 mile rides in the weeks leading up to previous events but L’Etape preparation is all about consistency, “A longish weekend ride with friends or with your Club is always worth it but the benefits come with consistent weekly riding that includes some hill work.” If you have the time then an event or training week trip in April, May or June will pay dividends. Check out our Mallorca312 or Nove Colli packages. They are good preparation events. “Minimum 32t on the back! – unless you weigh around 70kgs! !” Saving your legs over 4000m over climbing is essential so dont be macho and just invest in appropriate gearing. In 2017, the Col d’Izoard climb came after 100 miles – “I spent well over an hour grinding up it thinking – why didnt I fit easier gearing” . So unless you are a mountain goat, seriously consider compact on the front and 28-32 on the back. Many new bikes these days cater for this range but it’s always best to check. Be prepared for the heat. It is likely to be warm or HOT. Not so easy maybe to prepare for this in the UK, but be aware that, if it is warm, your effort will need to be measured and your intake of electrolyte containing liquids will need to increase. Salt tablets are also an option if you are prone to excessive sweating or have suffered from cramping in the past. There are a couple of ways to get to Geneva for the Etape du Tour. If you don’t want to take your bike with you on a flight then check out BagSOLO. All Things Ride clients get a 10% discount and they transport your bike from door to door. Airlines are getting much better at bike transport however there is always the risk of it getting delayed enroute. Bike rental is also an option, although we recommend booking well in advance for L’Etape. Hire bikes are typically high end and a match for an event of this type. Each has benefits and drawbacks. Our choice is a door-to-door transfer or maybe group together, pack up a car, drive down and make a week of it. There are loads of great routes around Annecy & Le Grand Bornand and there’s nothing like riding your pride and joy around and exploring new surroundings! L’Etape 2018 starts in Annecy and finishes in Le Grand Bornand. With this in mind, we recommend staying with us in Saint Jean de Sixt. 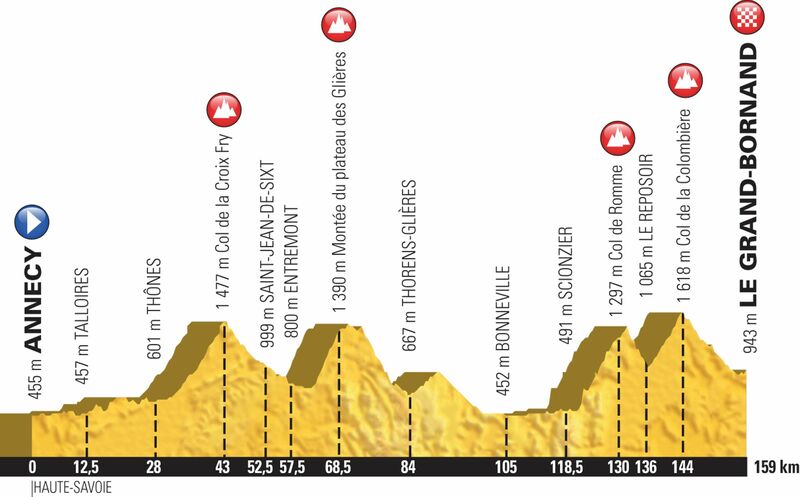 It’s around 1.8km from the finish. Otherwise, its a 45-minute coach ride back to Annecy and then a short ride back to your hotel. Le Grand Bornand / Saint Jean de Sixt have several iconic climbs nearby so arriving on Thursday is recommended if you want to go exploring on Friday. Make sure you have the right clothing to hand. It’s likely to be chilly first thing in the morning, baking hot in the valleys and then brisk at the top of each of the major climbs. Lightweight waterproof jackets or gilets are worth considering while arm warmers are great to chuck on before heading down the descents. Finally, to collect your entry you need your race number printed out and a signed medical certificate. The Expo has a stack of suppliers showing off all sorts of cycling related kit, so why not pick up a little something. On Saturday, we will get everyone to the Expo to collect their race packs. DON’T FORGET YOUR MEDICAL CERTIFICATE. You will need this in order to collect your race number. If you purchase any new kit and/or nutrition then avoid using it for the event unless you are confident that it will perform. The last thing you need is a dodgy stomach 70 miles into the ride because you used a new gel that doesn’t agree with you. Grab an early breakfast, ideally 2 hours before your start time, and bring some light snacks like a banana for munching in the start pens. The pace is always quite high at the start. Try and join up with some groups on the flats and relax! Enjoy the experience and take it easy on the first few climbs! Keep fed and watered (‘little and often’ is a good mantra) don’t wait to feel thirsty or hungry. The broom wagon starts shortly after the last rider at around 9am. It sweeps up slow riders so they can re-open the roads with as little disruption as possible. As previously mentioned, selecting a quicker finish time when signing up will help out a little but don’t worry about this too much. Be sensible, find some groups or friends going around the same speed on the flats, limit your time in the feed stops and just keep heading upwards on the climbs. The organisers ASO want to make sure everyone finishes, so as long as you’ve done suitable training then have faith that you will make it to the end. Well done you made it! Typically, the pain is worth it for the euphoria and shared sense of achievement that completing something like this brings. It’s a long descent to the finish in Le Grand Bornand so be careful since tiredness my be kicking in. With 15,000 riders taking part, the finish line will be busy. We recommend not spending too long hanging around. Grab your medal, a drink and goodies, do a warm down spin to Saint Jean de Sixt and celebrate your achievement! “It’s hands down one of the best events I have ever done!” – so what are you waiting for?